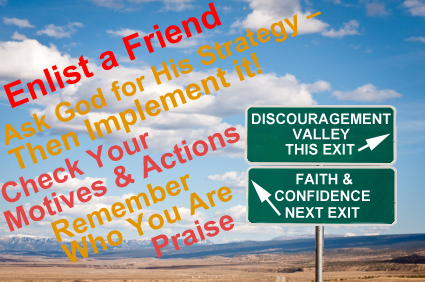 Ask God for His strategy – then implement it! There is a final action that will help you with these first four steps. Ask them for encouragement. Ask them to remind you when you can’t remember about the goodness of God and about your own worth and value. Choose to believe them when they remind you how important you are to God. Choose to believe them when they remind you that God has gifted you uniquely and specifically for the things He’s called you to. Choose to accept their love when they offer a hug or an arm around your shoulder. Ask them for loving accountability.We all need someone who will lovingly tell us when we’re not making good choices – choices that build our faith. Give your trusted friend permission to do so and heed their words. Perhaps we’re not remembering to praise (or have slidden further down the slope into complaining). A trusted friend can often spot our slipping behavior before we do and remind us gently to return to praise. Perhaps we’re not embracing our identity in Christ. Your trusted friend can be a tremendous encouragement to you reminding you that you are a forgiven, redeemed, child of the Most High God and bride of Christ. Perhaps we’re still working in our own strength or to please others. Allow your trusted friend to challenge you without taking offense. Perhaps God has given us His strategy but we’re backing away from it. Our retreat may be from fear or simply poor priorities. A trusted friend can help us see what’s happening and encourage us to begin walking in the right direction. 9Two people are better off than one, for they can help each other succeed. 10If one person falls, the other can reach out and help. But someone who falls alone is in real trouble. 11Likewise, two people lying close together can keep each other warm. But how can one be warm alone? 12A person standing alone can be attacked and defeated, but two can stand back-to-back and conquer. Three are even better, for a triple-braided cord is not easily broken. Enlist a trusted friend to help you strengthen your faith, and be intentional about making it a triple-braided cord – that is, one that includes God. When you enlist your trusted friend, be sure that you both agree that your goal is to grow in faith and pursuit of God. Develop your relationship to be one in which you spur one another on to the good works God created you to do (Ephesians 2:10). Momma Knows Best…Two Heads are Better than One! 9Two people can accomplish more than twice as much as one; they get a better return for their labor. 10If one person falls, the other can reach out and help. But people who are alone when they fall are in real trouble. 11And on a cold night, two under the same blanket can gain warmth from each other. But how can one be warm alone? 12A person standing alone can be attacked and defeated, but two can stand back-to-back and conquer. Three are even better, for a triple-braided cord is not easily broken. As I read this passage last week, my first reaction was to praise God for the perfect life partner He’s given me. My husband is God’s gift to me, given to demonstrate unconditional love. As I read verse 12, however, I saw a much broader application. Verse 12 tells me a couple of things. First, it tells me that being alone is a dangerous place. The enemy will attack those who allow themselves to live a life without relationships. There are those who take pride in being a loner. Let me encourage you if you are one of those people to resist the label and the urge. Loners are people who are at risk. Verse 12 tells us that the person standing alone can be attacked and defeated. The enemy will attack and has the ability to defeat the person standing alone. Knowing this, we ought to take care NOT to be alone. Even when that’s what it feels like we want, we need to ensure that there is at least one person around us to help fight our battles. Conversely, when we see others who are alone, we can become that battle partner sometimes. This doesn’t mean we’re always in battle. It can also be the fun things we’re doing that makes the person not alone – those things are part of the battle. We’ve been having a lot of conversations about community in our house lately. Community, especially Christian community, offers protection against all sorts of trials the enemy will throw at us, and as Phil and I see the end times approaching we believe that Christian community will be more important than ever. But I digress. This passage provides a great picture of a friend – one who stands back to back with the person to fight off their enemies; one who helps us out of a pit when we’ve fallen in it. A friend is not one who tears us down. If there is someone in your life who is tearing you down, they are not your friend. If you are tearing down someone in your life, you are not being their friend. We are called to be friends, encouragers, and bearers of one another’s burdens. So I see the passage cautioning us to be purposeful and careful in developing relationships so that we have at least one friend who will always have our back. That often means reaching out when I want to draw back. It also cautions us to be that friend to someone else who needs it. Again, that often means reaching out when I want to draw back because the person who needs a friend may be someone who is difficult to friend. Perhaps, if the enemy has been attacking that person for a long time he has won the battle for his or her joy. Such a person needs someone to pull them out of the pit, to warm their soul and to have their back. That kind of relationship can be difficult and the battle we help to fight can be a hard one. But then we have the last part of the verse: “a triple-braided cord is not easily broken.” It is that third strand, Christ in the midst of the relationship, that ensures our victory. He provides the strength – emotionally, physically and spiritually – to stand when we would rather rest. He provides the love when we would rather not love. He provides the wisdom when there seems to be no way to victory. He provides rest and nourishment in the midst of the battle. As mom always said, “two heads are better than one.” Be purposeful in developing relationships in 2012. And be sure it’s not just the two of you in the relationship – seek out friendships with fellow believers and make Christ the center of your fellowship. For your protection and theirs…and for the glory of God. Comments Off on Momma Knows Best…Two Heads are Better than One! 6 A time to search and a time to lose. When you put those Scripture together, I get excited. There was a story in the news earlier this year about a study done by the Oxford Dictionary. The Oxford Dictionary is the dictionary to beat all dictionaries. Here in America, when we think of dictionaries, we think of Webster. In London, they think of Oxford. The study identified the 25 most commonly used nouns. The noun that is used more than any other noun is the word “time”. Also in the list of top 25 nouns are year, day, and week. So 4 of the top 25 words relate to time… The world is obsessed with time! So obsessed that the US Government has two different agencies that are responsible for keeping the “official time” of the United States. Seems to me that one agency would be sufficient. I think the reason we’re obsessed with time is because we can’t control it. It continues moving forward no matter what we do. Sometimes it seems to move more quickly and sometimes more slowly, but no matter what we do, it continues on. We try to control it. We talk about managing our time. I googled “time management” and got 43,900,000 hits! Nearly 44 MILLION! That made me curious, and since searches are so quick and easy, I decided to google just the word “time.” There were more than 14 BILLION references to the word time. Yes, I’d say we’re obsessed with time. I think we’re also obsessed with time because we don’t really understand it. Sometimes it seems to move quickly, sometimes it drags. It seems to just disappear sometimes and when we’ve taken an unexpected nap we can become totally disoriented – largely because we can’t figure out what day/time it is. In all this stress over time, there is reason to rejoice and have peace. 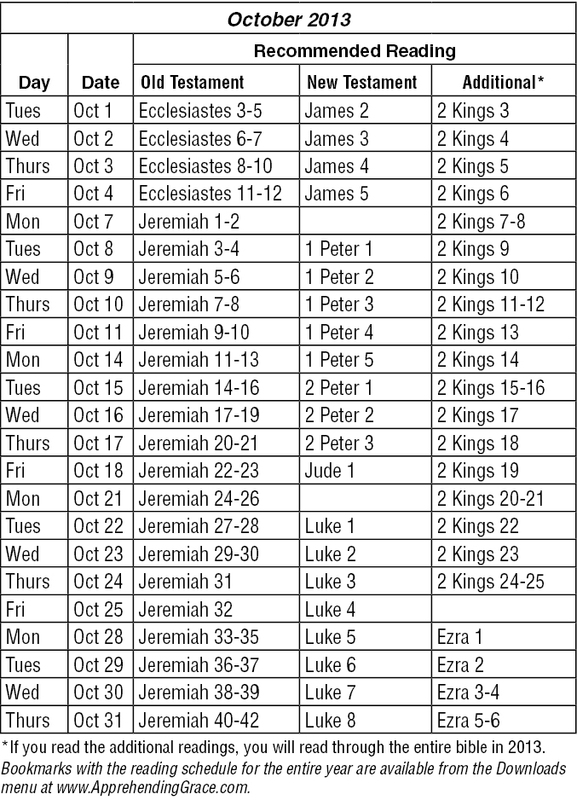 Let’s look at some of the things Scripture tells us about time. 1) God exists outside of time. Now I don’t understand what that means or how that happens, I just know that it is. Scripture is clear that God is eternal. That means He existed before time began and he will exist after time ends. There was never a time when He didn’t exist and there will never be a time when he won’t exist. Isaiah 57:15 says that God “inhabits eternity” – in other words, He lives in eternity. 1In the beginning God created the heavens and the earth. 2Now the earth was formless and empty, darkness was over the surface of the deep, and the Spirit of God was hovering over the waters. 3And God said, “Let there be light,” and there was light. 4God saw that the light was good, and he separated the light from the darkness. 5God called the light “day,” and the darkness he called “night.” And there was evening, and there was morning—the first day. At the moment God created the first day, He created time as we measure it. 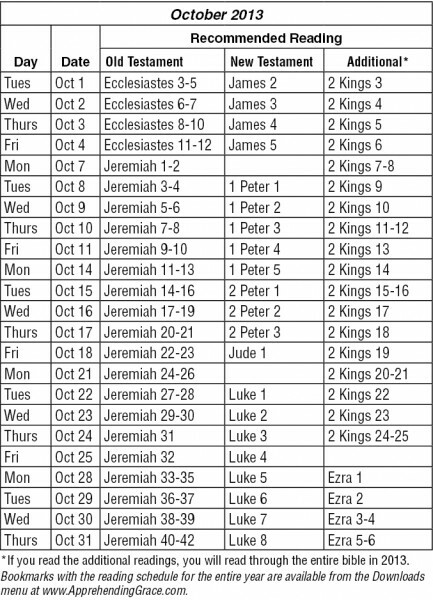 The creation continues story by identifying what God did during the first seven days of the existence of time as we know it. Since God created time, we can trust Him with our time. When I am stressed because I have too much to do and too little time, I can take a step back, remember that God created and controls time, and rest in Him. 3) God has a purpose for our time and wants to be involved in our lives. Did you ever wonder why you were born when you were born? I think girls especially sometimes look at history books and maybe they see the pretty clothes of the Victorian era or some other time and they begin to wish they had lived in another time. 26From one man he made every nation of men, that they should inhabit the whole earth; and he determined the times set for them and the exact places where they should live. 27God did this so that men would seek him and perhaps reach out for him and find him, though he is not far from each one of us. Ecclesiastes 3 says that there is a time to be born and a time to die. This passage says the same thing, but it goes a bit further. It says that God determines the time for us to be born and the time for us to die. He also determined the exact places where we should live. Why? So that we would seek Him and reach out to Him and find Him. God’s actions throughout history have been aimed at one goal – that we would seek Him; that we would reach out and find Him. It’s so important to God that we have a relationship with Him that He sent His Son to earth. He understood that it can be hard for us to understand what we can’t see. So Jesus said “I’ll go! Send me.” Then He stepped out of eternity and stepped into time. And that was such a climactic event in all of human history, that time is measured before and after it. We live in the year 2011 AD – in other words, 2011 years after Jesus lived. This passage says that God sent His Son, Jesus, to buy freedom for us so that we could be adopted as God’s own children. And when we are adopted as His own children, everything He has belongs to us. God’s highest purpose, is to give each of us an opportunity to be adopted as His son or daughter. 8But God showed his great love for us by sending Christ to die for us while we were still sinners. 9And since we have been made right in God’s sight by the blood of Christ, he will certainly save us from God’s judgment. 10For since we were restored to friendship with God by the death of his Son while we were still his enemies, we will certainly be delivered from eternal punishment by his life. 11So now we can rejoice in our wonderful new relationship with God—all because of what our Lord Jesus Christ has done for us in making us friends of God. “Now we can rejoice,” Scripture says, because when we believe what Scripture teaches and trust Jesus for our life, God adopts us as His sons and daughters and all that He has is ours. Remember, one of the things He has is eternal life…He lives in eternity. When we trust Jesus, we will live in eternity with God. Yes, He has still appointed a time for us to die, but it’s not an eternal death, it’s merely a crossing from this life into life with God for eternity. Like I said earlier in this blog, I don’t understand eternity. You know what? That’s OK, because what I do know is that spending eternity with God is a GOOD thing. When my time on this earth is done, when God’s purposes for my life on this earth are accomplished, God has appointed a time for me to die. But He is arranging the events of my life so that I will seek Him and find Him. When your time on this earth is done, when God’s purposes for your life are accomplished, He has appointed a time for you to die. In the meantime, He’s arranging the events of your life so that you will seek Him and find Him. If you haven’t found Him, I encourage you to continue to seek Him. You can read more about how to find Him here. The time is right! ’Tis the season. And the month of July, in addition to falling during our Summer of Praise, is the season for reading Ecclesiastes this year! We’ll follow that up with several minor prophets – Joel, Amos, Obadiah and Jonah. In late July, we’ll relax with some Psalms. 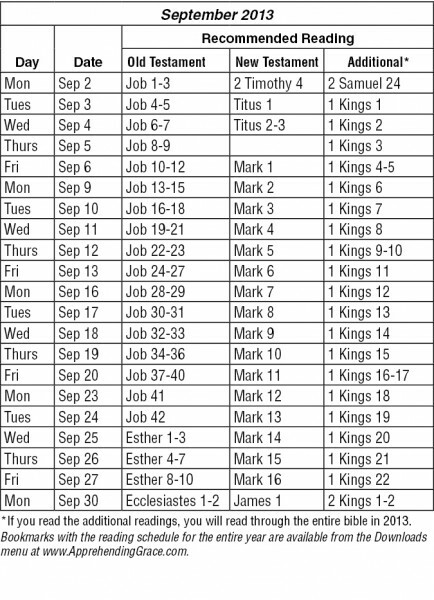 In the New Testament, we’ll read Galatians, Philippians and begin the Gospel of Mark. Do not be in a hurry to leave the king’s presence. Blow the trumpet in Zion; sound the alarm on my holy hill. Let all who live in the land tremble, for the day of the LORD is coming. It is close at hand. And afterward, I will pour out my Spirit on all people. Your sons and daughters will prophesy, your old men will dream dreams, your young men will see visions. Even on my servants, both men and women, I will pour out my Spirit in those days. I will show wonders in the heavens and on the earth, blood and fire and billows of smoke. The sun will be turned to darkness and the moon to blood before the coming of the great and dreadful day of the LORD. And everyone who calls on the name of the LORD will be saved; for on Mount Zion and in Jerusalem there will be deliverance, as the LORD has said, among the survivors whom the LORD calls. The day of the LORD is near for all nations. As you have done, it will be done to you; your deeds will return upon your own head. Those who cling to worthless idols forfeit the grace that could be theirs. But I, with a song of thanksgiving, will sacrifice to you. What I have vowed I will make good. Salvation comes from the LORD. We’ve got some great reading ahead of us, friends! Enjoy it! 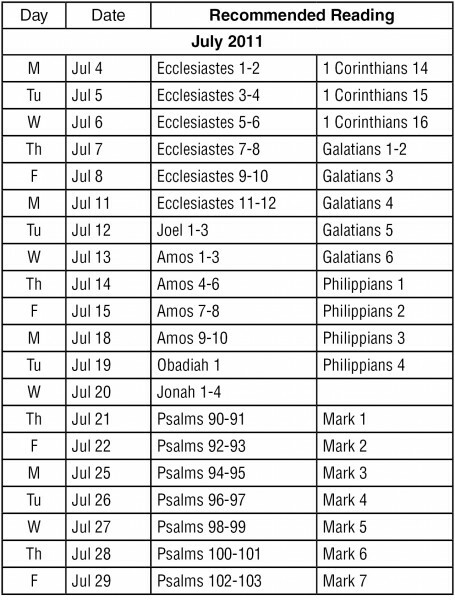 To download a PDF of the July 2011 recommended reading plan, click here.